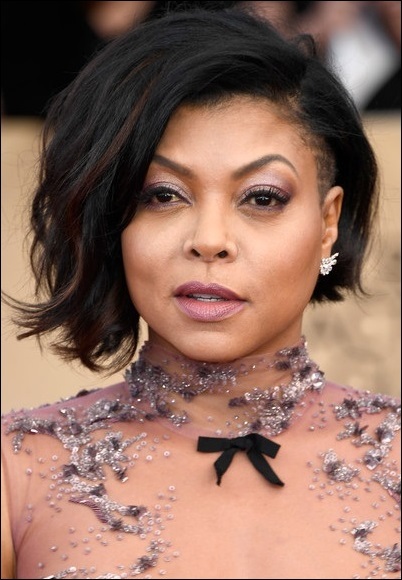 Celebrity makeup artist Ashunta Sheriff tells us how she created the makeup look for 2017 SAG nominee Taraji P. Henson. 1. First, she prepped skin by using Dermaflash to exfoliate and remove peach fuzz. 2. Then she used Kate Somerville Goat Milk De-Puffing Eye Balm to decrease puffiness and hydrate eyes. 3. Next, she used the brand’s DermalQuench Liquid Lift and Quench Oil Free Hydrating Face Serum to plump and hydrate skin. 4. Sheriff applied Dior Airflash CC Primer before applying Perfect Blend by Ashunta Sheriff in Tan to even out her skin tone. 5. She set the look with Ben Nye Luxury Powder in Banana, which is great for warm skin tones like Henson’s. 6. To get a soft rose glow affect, she used Taraji’s MAC Collection Highlight The Truth on the lid by tapping with her finger and using a MAC 266 angle brush on the lower lash line for a soft smokey affect. 7. Then she applied Taraji Glow, a coppery gold highlight in the corner of the eyes and to the center of the eyes to make them pop. 8. She used Penultimate Eye Liner from Taraji’s MAC collection to draw a tight precise line on the top lash line. 9. Sheriff then used Haute and Naughty Tooo Black Lash Mascara, applying two coats to the top lashes and one coat to the bottom lashes. 10. She then filled in the brows with Damone Roberts Minx Brow Pencil. 11. Now on to the cheeks, she applied Maybelline Crème Blush Stick to give it a soft subtle warmth and then highlighted the cheekbones with Anastasia Beverly Hills Glow Kit. 12. She lined the lips with MAC Cosmetics Plum Lip liner. 13. Then she filled in the lips with MAC Cosmetics Amplified Lipstick. 14. She used a touch of MAC Cosmetics Lipglass for a little bit of shine. 15. Lastly, she set her pout with Model in a Bottle Makeup Setting Spray, Sensitive Formula for Lips.